If you’ve been reading Lisa Kleypas series of The Ravenels, then you’ll have encountered Dr. Garrett Gibson before as she was introduced in previous books. Now it’s time to tell the story of the only female doctor in London. She has a busy practice, friends and family but perhaps she should start thinking about her heart. After she receives help in fending off some attackers by Ethan Ransom one evening on her way, she accepts Ethan’s proposal to teach her some self defense tricks. Ethan, who’s been keeping an eye on the lovely doctor for quite some time, only put him at risk for falling in love. For Garrett everything seems quite clear, why not enjoy Ethan’s company but Ethan doesn’t want to bring Garrett to close into his life for putting her in danger after all he is a spy and his current assignment will have some serious repercussions but fate keeps putting these two together time and again. 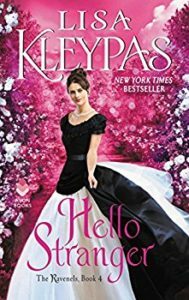 I’ve enjoyed a lot of Lisa Kleypas’ books before and while I liked the characters in this one, it wasn’t my favorite. I found Ethan’s story a bit convoluted, or his work and the political intrigue, so that sometimes took away from my enjoyment. I have not read any of the others in this series but I will be looking for them as we got glimpses of some of the other “Ravenel” characters and I would love to know their stories. I haven’t tried anything by this Kleypas before, but I keep hearing great things about her books. I hope you like the other books in this series a bit more when you get to them. This one sounds interesting! Melody – I hope you enjoy it. It was fun! Lark – It is set in Victorian England. Sorry I missed mentioning that. No worries, I’ve disabled comments on older posts due to junk mail and haven’t figured out a good way around it! Literary Feline – She reminds me a bit of Amanda Quick. Have you read hers? I jus like that the characters are strong and seem real. Hope you get a chance to check it out.